Ps. next post will be on mixing down! 🙂 stay tuned! THE FILTER: (outlined in Turquoise) This is basically the controlling section of the noise. so the Cutoff is how much of the sound you want to pass through. The resonance basically just amplifies the sound. 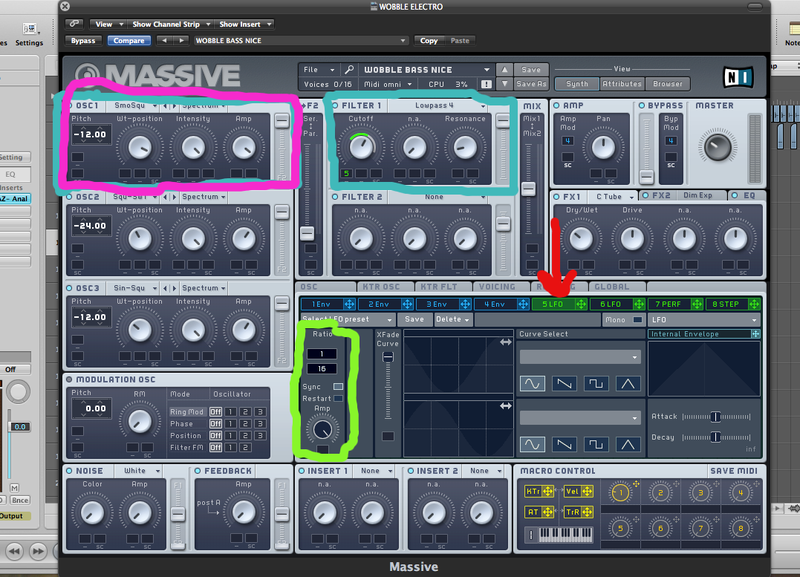 In this case we have a low pass filter selected (You can select which one you want by clicking on the drop down menu at the top of the box) Again you’ll see the fader at the side which means you can route it to another filter again but for this exercise we haven’t so we put it up to just allow it through filter one. You’ll notice on the cutoff that there is a green number at the bottom of the cutoff knob this is how we have Routed The LFO. (you do this by clicking where the red arrow is pointing and dragging it to the box where the green number is in). THE LFO: Is a Low Frequency Oscillator, This modulates the audio signals coming through and it is a pulsing rythym unlike the ocsillator which is just an audible tone. You’ll notice that on the left side is a fraction that says 1/16 now this is how you can changes the speed of the pulsating rythym (Wobble). You change it by dragging the box where the ’16’ is up and down till you gain the rythym that you require. When you drag the cross section to the filter you drag the green number up and down to gain a line around the knob, this is basically controlling the LFO within the filter. Now you should have a Wobble Bass line happening. If not please don’t hesitate to ask questions. I apologise about not updating more regularly firstly. I shall be explaining how to structure your track. which is what i found the hardest out of all things to do with music (Strangely). The first thing you should know is that a little bit of maths is involved here (i see you all turning your web browser to Facebook). as simply as i can put it music structure is called bars. You will see in the top half of logic there are numbers and lines, these are markers of the bars. you’ll see that in the picture below coloured red. The structure goes up in bars of 4,8,16,20 etc . 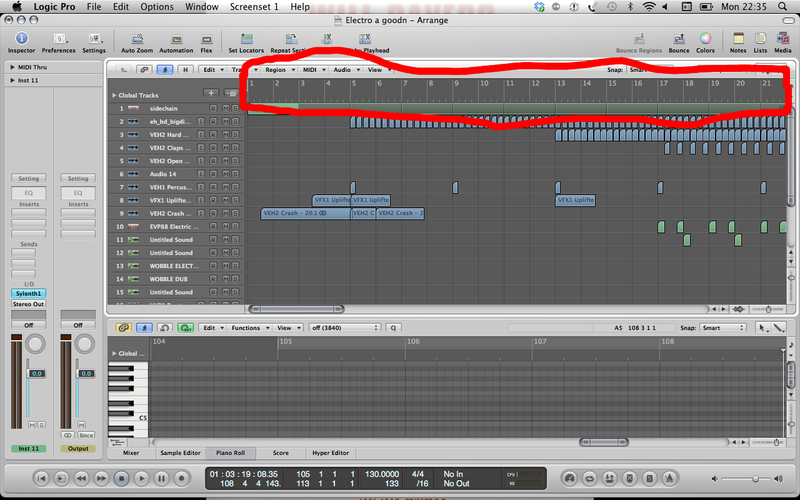 normally a house/electro track will have an intro of 32 bars. then a breakdown between 16-32 bars then the main element of the track for up to 32 bars then a breakdown again then another drop then an outro for 32 bars. I hope that makes sense? if not please ask questions and ill try help! also again if you have an easy way of explaining please comment!